High Net Worth and Affluent Investors are seeking a solution to the growing complexity of today’s markets. Few are satisfied with their current situation. They thirst for simplification, however finding a solution has not been easy. The solution is not an easy one, the advisor must understand all aspects of your financial needs and be able to help communicate between disciplines. Based on the report, the requirements in a solution became increasingly apparent. Clients in the High Net Worth segment want increased transparency from the investment managers handling their financial affairs. And a growing desire to see information presented in a way that measures progress against financial or life goals. High Net Worth investors and their advisors need to closely coordinate activities among third-party service providers – such as accountants and estate and tax attorneys, Investment and insurance advisors – to execute complex wealth strategies. More and more High Net Worth investors are adopting institutional-like processes to manage their wealth, asking service providers for financial and estate plans, philanthropic and charitable giving plans, investment policy statements and regular risk assessments. 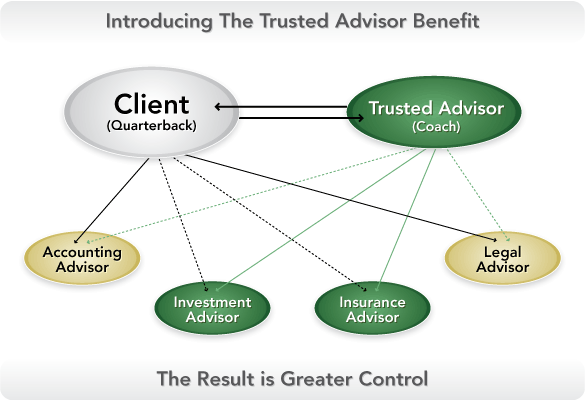 Advisor-Client Relationship: This simplified graphic reminds us that the client is the focal point of any strategy. The Trusted Advisor Concept is a stronger role than a simple Relationship Manager. The Trusted Advisor helps the Client communicate with their other advisors to insure they are not working at cross purposes. Our role in the High Net Worth Space takes the form of a Relationship Manager with the Private Money Manager and we continue to coordinate and provide additional services as needed.. We currently have Referral arrangements with 3 Institutional managers. Fees are banded and the rate charged, reduces on with higher asset amounts. We can offer all the benefits of a family office with world class investment advice. What is the Premier Investment Program? The Premier Investment Program is a fee-based account that offers a range of investment services and the ability to hold a wide variety of investment products including mutual funds and individual stocks and bonds. Virtually every investment offered at Manulife Securities can be held in a Premier plan. The Manulife Private Investment Pools program offers a range of diverse investment pools with high conviction portfolio managers from Manulife Asset Management and Mawer Investment Management Ltd. Add in competitive management fees, tax efficiency and flexible options and you’ve got an investment program that truly understands your needs. To learn more about Manulife Private Investment Pools, click here. The Masters Private Account Program is a Separately Managed Account (SMA) program that provides personalized investment management with individually tailored investments designed to meet the specific objectives and needs to today's sophisticated investors. Masters offers you a full range of benefits including discretionary account management through direct access to seven world-class Portfolio Managers and 17 mandates across every asset class. A full suite of investment mandates allows me to either construct portfolios by combining two or more mandates, or substitute an asset-class specific mandate to meet your individual needs. This elite product is unique to Manulife Securities and is tailored to clients with over $100,000 in investable assets. Benefits that are exclusive to Masters account holders are a personal portfolio management experience, independent and impartial due diligence, potential tax efficiency and a simply all-inclusive fee structure. For more information, please click here or contact us.